The original Terminal 1, built for Eastern Airlines, was demolished circa 1995. 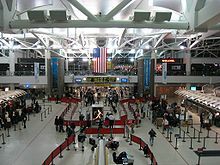 The current Terminal 1 was opened in 1998, 50 years after the opening of JFK, at the direction of the Terminal One Group, a consortium of four key operating carriers: Air France, Japan Airlines, Korean Air and Lufthansa. This partnership was founded after the four airlines reached agreement that existing international carrier facilities were inadequate for their needs.Terminal One has the capability to handle the Air France A380 route from Paris Charles De Gaulle. Terminal 1 has 11 gates.